Elinchrom has been the brand of choice for years many Europeans and Australians photographers alike. They are cheaper than Profoto or Broncolor, offer a good range of modifiers and – unlike Paul C. Buff – have service centers outside of the USA. To many photographers they also have been a great way to get into studio photography before moving up to Broncolor or Profoto. With the Elinchrom ELC Pro HD, it seems like the brand wants to change that and offer a higher-end light. [...]combine everything a photographer needs with everything a photographer wants, plus the consistency and reliability that you expect from Elinchrom. 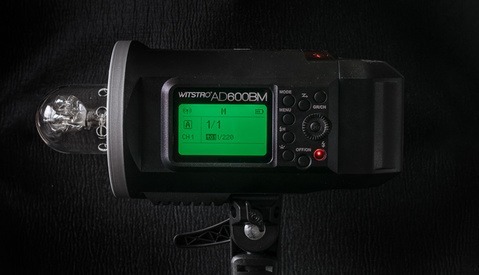 When translated into English, that means faster recycling than the BRX, shorter flash duration than the other strobes they carry, better user interface, stroboscopic mode, sequence mode and delayed mode. It sounds great on paper but at twice the price of their little brother the BRX, is it really worth it? I recently had the chance to get my hands on a couple of 500Ws and 1000Ws units for a few days for personal projects that required faster recycling time and shorter flash duration. As all of my studio gear is from Elinchrom already, I decided to give these strobes a try instead of renting out Broncolor’s or Profoto’s. Swiss flash companies like Elinchrom and Broncolor are well know for their tank-like built packs. When it comes down to compact units, the story slightly changes! Don't get me wrong, the ELC Pro HD units are better than anything else from the Elinchrom lineup. However, they are not up to the Profoto B1/D1 built quality standard. The handle to tilt the head feels very fragile and the screw to mount it on a stand is still the same system that I have had broken in my hands a couple of times for no reason (I am by no means a big or strong guy). Also the glass dome that sits in front of the flash tube seems as fragile as an egg! Another thing I love but also hate about Elinchrom strobes is the way their modifiers are mounted onto the heads. The Rotalux system is very practical when shooting a lot on location or having a small studio and having to fold the softboxes after use. However, the bayonet is just bothersome. It works great for a few weeks – months if you are lucky – and then the modifiers will screw in but not click in like they should. This has left me with a few modeling light bulbs broken and glass all over my studio because the softboxes were not properly attached. With the new dome system priced at $90 each, I would be really mad having the same experience! Please Elinchrom, look at Profoto and make something as easy for mounting your beautiful modifiers onto your units! Now onto the goods. The back of the strobe is well thought out and looks very solid. It has a small LED screen, a wheel to dial in the power or navigate in the menus, and a few buttons that are well placed - nothing fancy, just what is needed. If you are used to Elinchrom, you will be able to use the ELC Pro HD right away like any other unit you have had. If you are used to Profoto or Broncolor, I am sure it will only take a few minutes to adapt and then you will be good to go. Let’s turn these beasts on and forget about the slightly flimsy built quality. The LED screen looks superb and makes it so easy to setup the strobes! No more playing around with button combinations that I always forgot about. 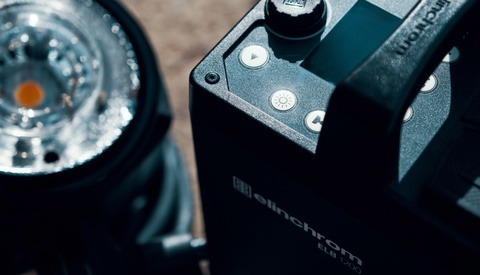 It was about time Elinchrom stopped creating products like if we were living in the nineties all over again! The menu is really easy to use, very intuitive, and it has everything you need accessible with just a few clicks. Before using the new modes (stroboscopic, sequence, and delayed), I used the strobes like I would use my current BRX. What is there to say except that they are great? In normal or slow recycling mode, the white balance was way more accurate and consistent than the other Elinchrom units I had used before. The recycling time, even in normal mode, was nothing short of impressive. I could shoot a bunch of pictures without having to wait for the unit to recycle and it almost kept up with my Canon 1Dx when the power was not set to high! Then came the time for my first photo shoot of the weekend: throwing sugar onto my model and trying to freeze it. 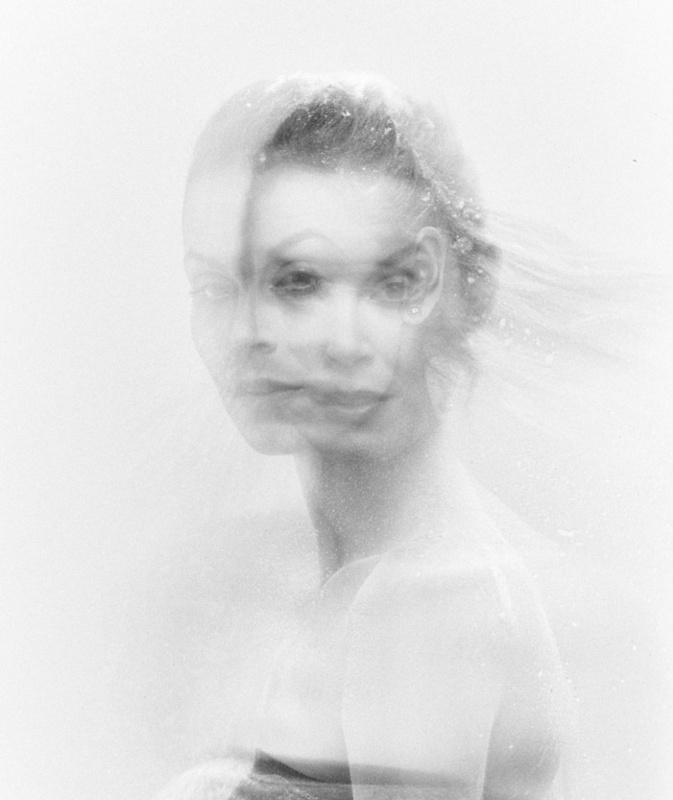 I needed multiple shots to create a composite in order to mask parts of her body. So I needed a consistent white balance to be able to properly combine the shots. I also needed short flash duration to freeze the motion and fast recycling to shoot multiple shots of each sugar throw. Needless to say, accurate white balance, short flash duration and short recycling times are not often the best of friends - especially in the monoblock world. For this project I used a basic three-light setup with my main light in front of the model and two rim lights. I had all my lights set to get the shortest flash duration possible. In normal recycling mode, the ELC almost kept up with my 1Dx. However, I had a few shots with only one or two out of three lights triggering. In fast recycling mode, I had less misfired flashes but it still was not perfect. Furthermore, the white balance was going crazy from one shot to another! Even the difference between two strobes in the same shot could be very visible! 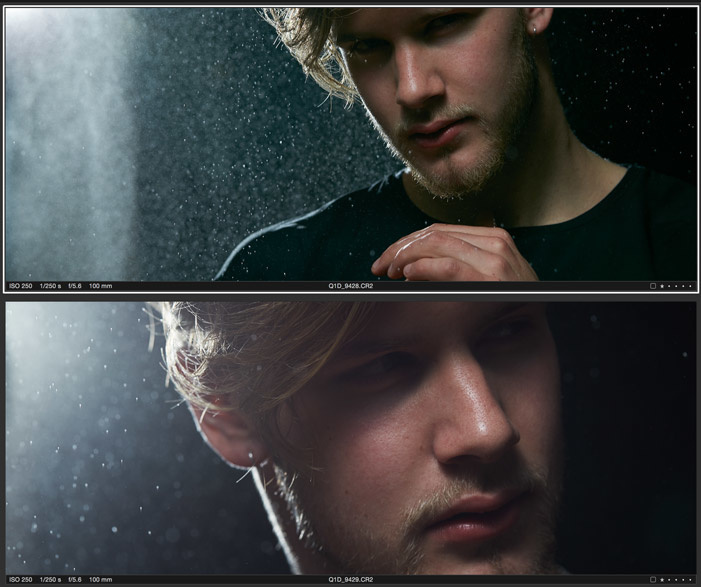 The difference of white balance between two shots when using the fast recycling mode can be quite shocking! Looking at the pictures closely, I saw that even though I shot at f/16, the photographs did not seem as sharp and frozen as I had hoped for. The model was very sharp but the movement of the sugar was not perfectly frozen despite using the power settings Elinchrom recommended. I must say I was a bit disappointed on that. I had higher hope on that point! I didn't have anything to measure the flash duration announced (1/5260th on the 1000Ws and 1/5000th on the 500Ws at t0.5), but seems that it was not short enough in real life to freeze flying sugar or water drops. Here is a closer look at the sugar and we can clearly see that it is not perfectly frozen by the strobes. 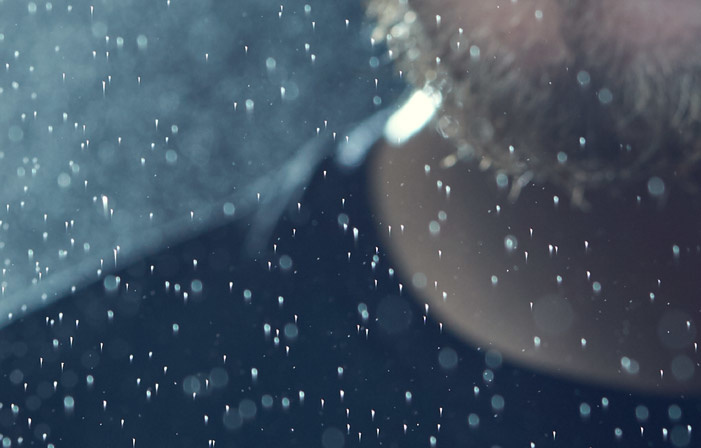 Another example but with water drops. Same thing, the water is still not perfectly frozen. The following day I used the different modes the ELC Pro HD have to offer. I tried the delayed mode first. It works just like it is meant to. The user guide even includes a full table with the recommended delay depending on your shutter speed. That's very helpful as the delay has to be fixed in milliseconds. I am good at math, but if I don’t have to calculate in front of my client for an hour to set up my shot, I feel more comfortable. This mode could especially be useful if you want the sharpest shot possible - kind of like a second curtain sync. You could also get creative and use it to show movement in your picture by dragging the shutter and triggering the strobe at a precise time. The stroboscopic mode is quite easy to use. But again, I would not try to set it up without the user guide. You first have to choose the length of your shot (exposure time) and then you have to pick a frequency. Seriously? Couldn't Elinchrom let us chose an exposure time that would be written like on our cameras and then the number of pops we need? Who wants to calculate how many flashes a frequency will offer depending on the exposure time length? Finally there is the sequence mode which allows you to trigger multiple strobes in sequence. Especially useful if you have a a very simple lighting setup or a lot of heads and want to shoot fast. For example you could setup two strobes next to each other and alternate between the two in order to get the strobes to fire successively in each shot. No need to wait for the strobes to recycle anymore! Now are all of these modes really useful? To some photographers, I am sure they are. To me, shooting mostly beauty in a studio, they only are a way to get shots I wouldn't otherwise think of. It might not be something I would use day in and day out, but if I had the possibility I would surely use them on specific projects. Getting artsy with the stroboscopic mode. This is where everything gets complicated. The BRX are about half the cost of these units, the new Siros from Broncolor are roughly the same price and the Profoto D1 is as well. With Elinchrom, these units are currently the best strobes you can get in their lineup. If you need something that will charge faster or have a shorter flash duration, well there is no current possible upgrade! I know they have packs, but they are so dated I would not even bother with it even if they offered faster recycling times than the ELC. However, if you go with the Siros or the D1, you buy into a whole new system and start with what is their entry level strobes. That leaves you with the possibility of upgrading towards more powerful, faster recycling and more solid units in the future if you need it. The thing is though, Broncolor and Profoto accessories and modifiers are more expensive than Elinchrom’s, and when starting out, you might not have the money for buying into these systems. If I had to buy a new system/brand today, I would probably hesitate. Elinchrom is great, I love their modifiers but the built quality is a bit on the flimsy side (not talking about the old Ranger RX here though). Broncolor and Profoto have higher end strobes and better packs that feel more rugged. Despite those new units, I still see Elinchrom as a brand most people would buy for budget reasons and not so much for their specifications. Elinchrom has had a great range of modifiers for years but always had very basic strobes. With the ELC Pro HD, Elinchrom users finally have something better with a great user interface and more options. It is a great step towards Elinchrom becoming a brand of choice for even the most demanding photographers. However, don’t get crazy about the ELC thinking they are the answer to everything. They are not. They cannot be compared to Broncolor Scoro or Profoto 8a either. They are still monoblock units, and as such, they do a great job! I hope Elinchrom will come up with a unit that can really freeze motion like the Paul C. Buff Einsteins do! They can even add a way to change flash duration independently of the strobe power much like Broncolor's packs let you do. That would be a dream come true! The ELC Pro HD are definitely not revolutionary by any means. However, they show that Elinchrom can also create new modern products and not just tweak old ones with minor changes. 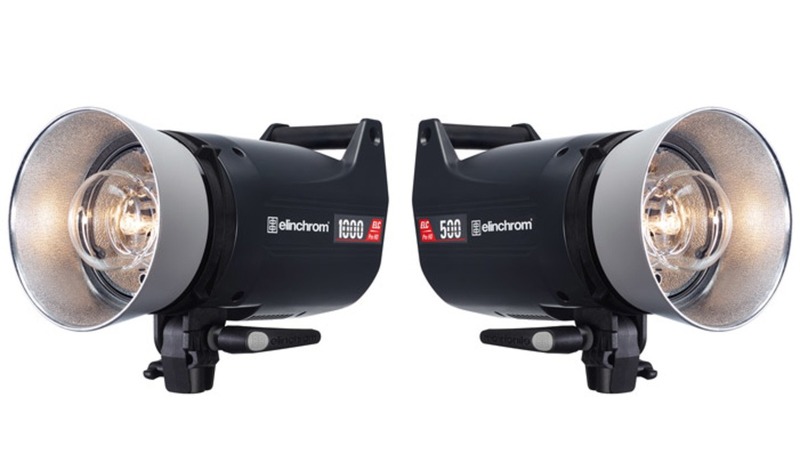 If I were to buy new Elinchrom units today, I probably would look at the ELC Pro HD units. They are very reliable and not so expensive. Are they worth paying twice the price of the BRX? That all comes down to the power you need and if the new modes of the ELC Pro HD are worth it for you. All in all, I loved these units despite the minor flaws they have. The Elinchrom ELC Pro HD are great, do what they were made for, and offer a more consistent white balance than the other Elinchrom strobes. The next step would be to compare them to the Broncolor Siros and see which one is the king of the compact strobes in that price range. "It was about time Elinchrom stopped creating products like if we were living in the nineties..."
The use of a tungsten-halogen modeling light shows they're not entirely out of the 2000s, never mind the 90s. 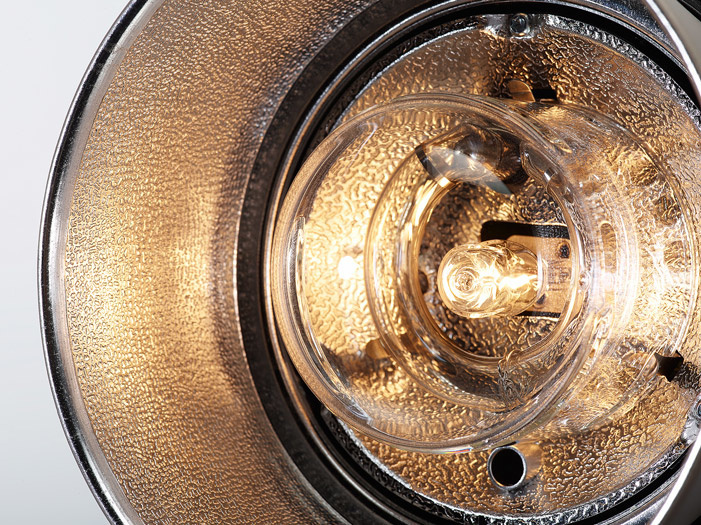 All these top brands have to get on the case and start using LED modeling lamps. We're halfway through this decade already. The head of a strobe is prime real estate. Most of it is taken-up by the flash tube, and only a few square inches remain for the modeling lamp. A typical 300 watt halogen capsule, used as modeling lamp in many leading strobes today, puts out around 6000 lumens. Good luck getting that much omnidirectional power out of LEDs from a capsule of that size. Another reason is that a 6000-lumen LED array would throw the price of any strobe way, way off. And since most people buy strobes for the flash, not modeling light, the jump in price would be a tough sell to consumers. I'm all for LEDs, don't get me wrong, but you incorrectly assume they're stuck in the past for the wrong reasons. It would be great to have the choice though. I am sure quite a few photographers that also shoot video would be ready to pay slightly more to get the choice of a LED modeling light (no fan noise, 5500K light, no heat). Elinchrom's marketing team was really smart with the ELC Pro HD. If you look closely at their website and ads, they never ever tell that these units will freeze anything. They only tell you these strobes can have a very short flash duration and they will let you be creative. I don't know about Germany, but in Switzerland the service is second to none. Their distributor is awesome and I can't complain about that. I have to agree with Quentin here. I am working since 8 years with Elinchrom and I have never ever broken anything. Built quality is not the same as Profot and Bron, yet its much better then all other players on the market in my opinion. Service - here in switzerland - is extremely good and fast. It seems like they grap some individual messages from the net and don’t check that it is related to an Entry level D-Light or a top end RX or ELC. When I started my small business as animal photographer I rented strobes. I have rented Bowen Gemini, Profoto D1 and Elinchrom RX600. Because I’m mainly working on events and with animals on events, animal stores etc... , I needed a system that was very robust, easy to set up day after day and that with color and power of light consistent during a day of work (1500 – 2000 pops). 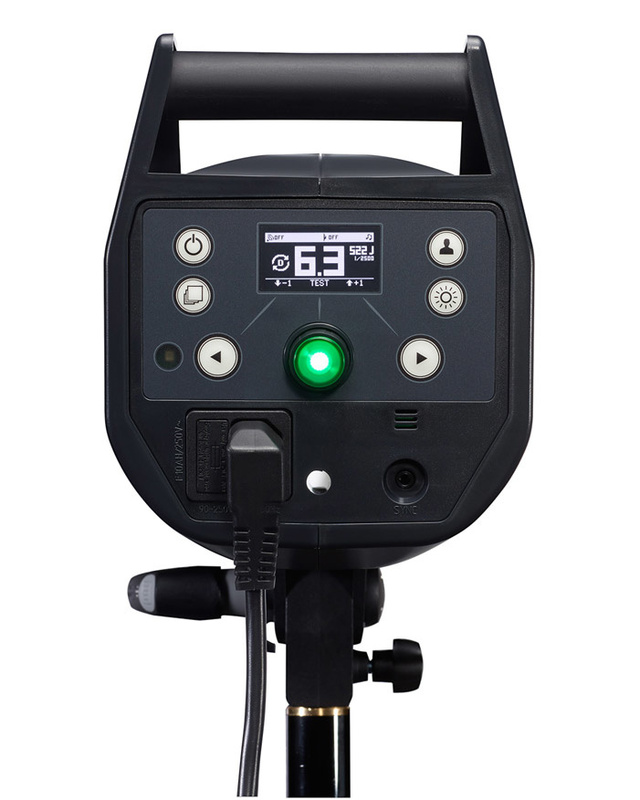 Bowens is built like a tank, but color and power is not consistent over a day. Also Flash duration is not always freezing moving animals. Profoto D1 has just a way to slow flash duration (fast recycling it is, but that’s is not a necessary feature) and one of the rentals failed during the day. I saved myself with a Nikon SB900 (and Higher ISO’s). The RX600 where fine to work with. Freezing flash durations and constant power and color during the day. Broncolor did not have a proper compact at that time. When my business was growing, I bought a set of 4 x RX600 and Rotalux modifiers. Unfortunately a year later Elinchrom launched there ELC’s. If I knew that beforehand, I had rented one more year. I have my RX600 in use for a little more than 2 years. Set them up and break them down approx. 170 times. Used them in clean studio, expo venues, big halls and dusty manages. They flashed approx. 200,000 pops. And I have not broken a single strobe yet and I’m not that carefully person. So to me, the build quality of the speedring bayonet, Spigot and electronics are more than fine (I know the D-light has plastic inside the speedring bayonet, and the first badge of BxRi as well, but the later BxRi and the RX600 has metal parts inside). If you break Elinchrom compacts (and especially the RX series), to me it tells more about the photographer skills that about the brand. "If you break Elinchrom compacts (and especially the RX series), to me it tells more about the photographer skills that about the brand." Well said, I agree with it. with the color shift, I would return them, I think there must be an electrical issue with the units, which isn't normal. I used the elc pro 500 for several bigger productions along with some profoto d1 and hensel strobes, and the elc pros were the most reliable, fastest and color constant strobes. their drawbacks are the mount (best practice with bigger boxes: put the box on the ground and mount the flash face down on it) and the tilt mechanism. The color shift was probably due to the fast recycling mode being active as color shift was apparent no matter which unit of the three I used. But when switched back norma recycling it was quite constant though, especially when compared to the BRX. €£inchrom is not cheap, for the price of things i'd rather go with Broncolor. I wanted to switch from Elinchrom to Broncolor because I wanted to go "to the next level". After half a year, I switched back. I can not afford Broncolor. But I can afford Elinchrom. The Broncolor Equipment is at least 2-3 times more expensive then Elinchrom. Starting from Lights and ending with Light Modifiers and Grip or Accessories. So if price is an argument, you may definitely not wanna go to Broncolor over Elinchrom. If you go for quality, then Broncolor is a tad better. But for my daily business, I decided that this little tiny "bit more" I get from Broncolor doesn't add enough with the huge difference in the price. I work in portraits, advertisements, editorials for rather large clients. And Elinchrom has always been good enough. I was fooling around with my comment. Well, thing is, people like Karl Taylor use Elinchrom, or at least he used to and to be fair the results were nothing short of amazing. The quality is not that noticeable for the price difference, what you get is versatility and gizmos to help your workflow. I was trolling with my comment up there but i don't find the Elinchrom equipment expensive if you look at the quality they give you. Broncolor is great, but the price tag is to damn high, 20.000USD can give you 2 times more Elinchrom equiment for a studio than Broncolor. By the end of the day your skill will tell more than the lights/mod used. Nice review. I’m interested in upgrading my RX monolights to these but it looks like they removed the remote socket that I currently use on the RXs to be able to trigger these with PocketWizard PowerST4s, which is unfortunately a non-starter for me. Is there any adapter available that will allow a PowerST4 to be connected to these or am I out of luck? I am not sure if there is any adapter currently available. But you might be able to pull it off with TT5s instead of PowerST4 like some do with the Quadra (like this for example: http://draganbjelic.com/finally-how-to-sync-elinchrom-ranger-quadra-with...). You might to get in touch with Elinchrom, maybe they have an option I am not aware of. Any tips on rugged stands / boom arms you successfully put these on? Thank you!